Michael Schaffner and Marquett Milton, two United States Colored Troops reenactors, use toy soldiers to discuss the formations used during the course of Civil War battles. Picture was taken at the African American Civil War Museum in Washington, DC. The following images feature Michael Schaffner’s toy soldier collection, which depicts United States Colored Troops (African American Civil War soldiers). Schaffner has found them to be useful for teaching and training. For whatever reason, I find this to be cool; your mileage may vary. All images provided by Schaffner. The place to be on November 13-15, 2015 is Harrisburg, Pennsylvania for the 150th anniversary of the Grand Review. You can be part of these history-making events that will take place each day with the actual Grand Review precession on November 14. 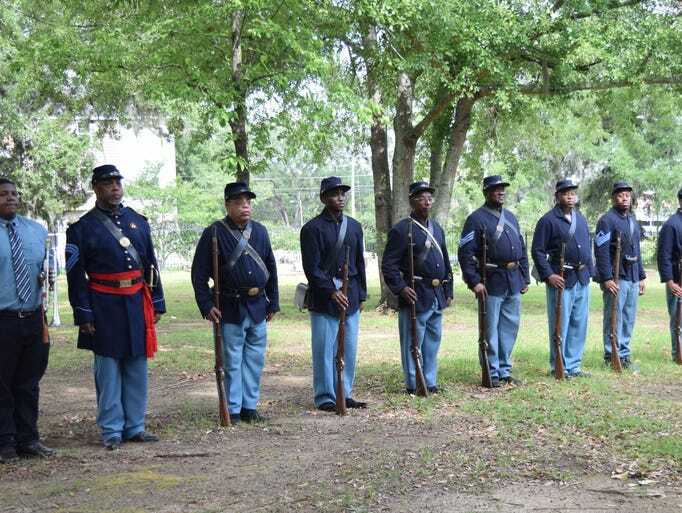 United States Colored Troops (USCT) re-enactors from several states will be part of the Grand Procession taking place and many of the other events connected to it. 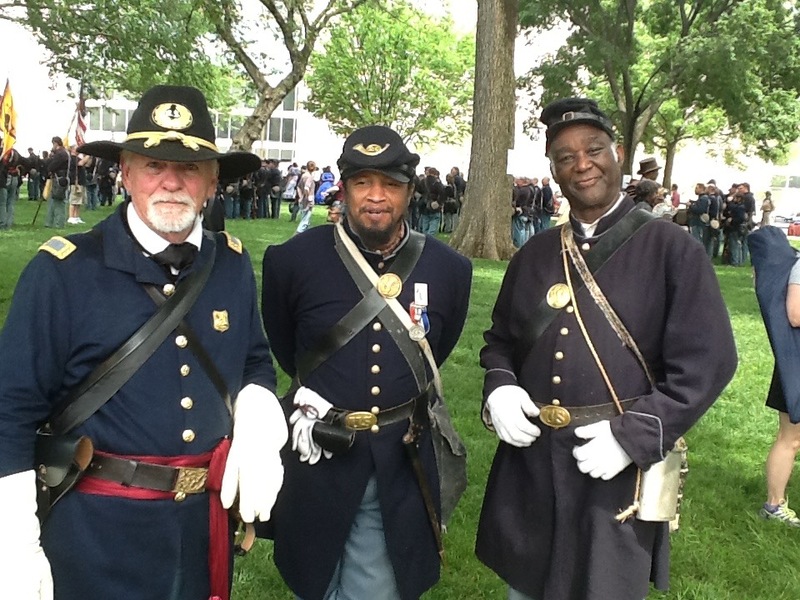 In fact, the USCT re-enactors are conducting their national annual meeting here in Harrisburg in conjunction with the Grand Review. 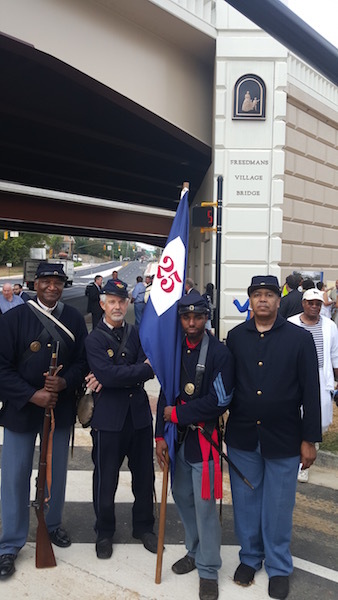 On Friday and Saturday Strawberry Square, the urban mall at Third and Market streets, will be transformed into a “chautauqua showcase” where history buffs, educators, visitors, and locals can enjoy the various displays from the USCT regiment re-enactors and living history actors. We encourage you to bring your children to this family event. 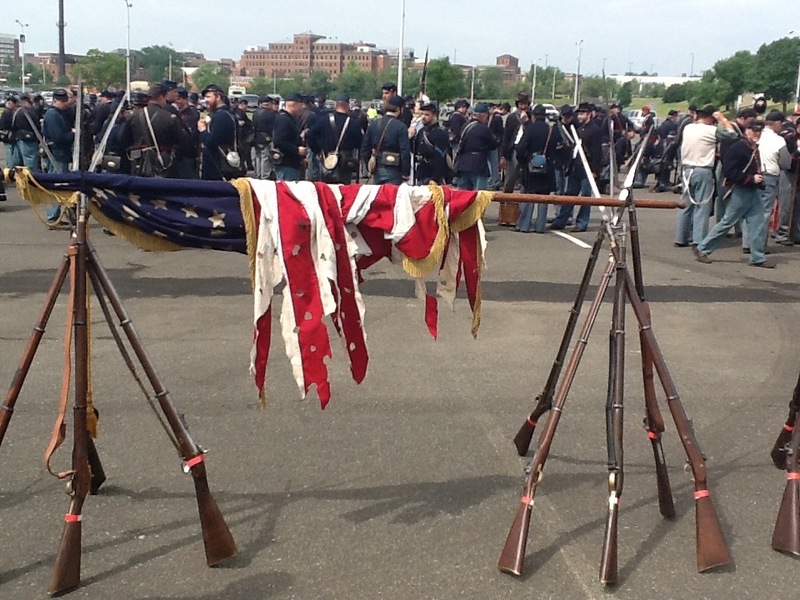 The US Colored Troops Living History Association (USCTLHA) will hold its Annual Meeting during the weekend. Go here (USCTLHA Facebook page) for more information. There was a Grand Review Event in 2010; pictures therefrom are here. 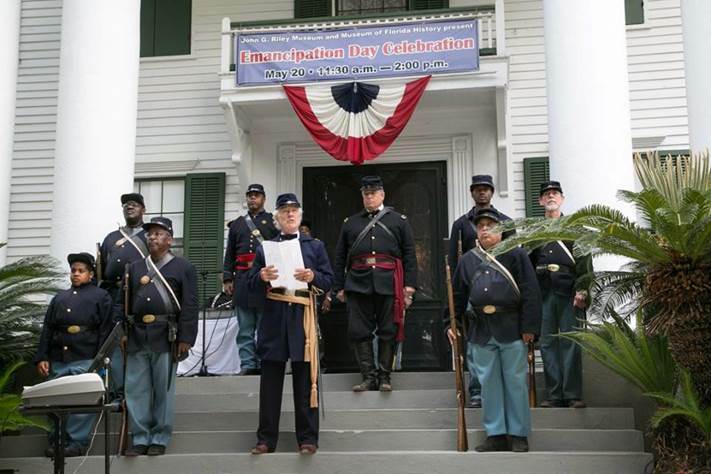 Of course May 20, 1865, was not the first time that slaves in Florida had heard of the Emancipation Proclamation or gained freedom as a result of the war. Union forces made forays into Florida throughout the Civil War. The state was not strategically important enough for the Union to conduct many operations there. But Union troops did, for example enter Jacksonville during the war, and that city changed handed hands several times throughout the conflict. 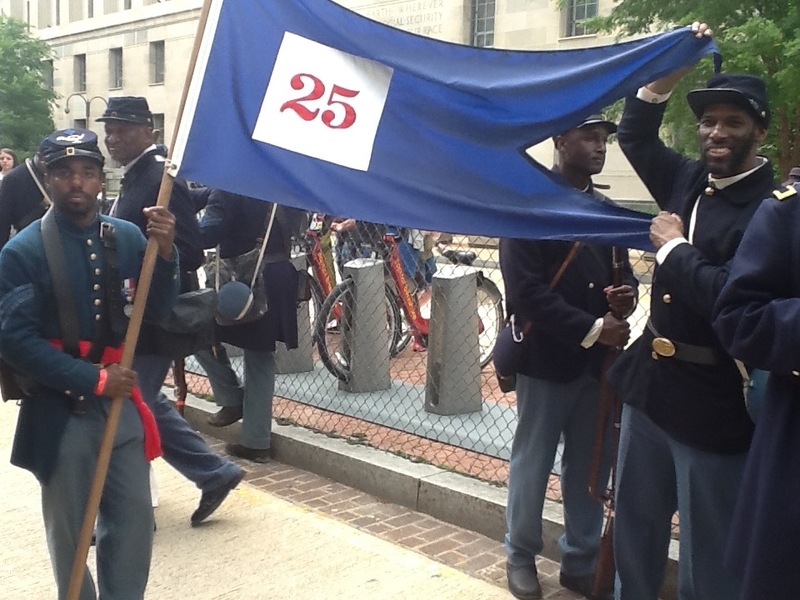 Some of the Union forces consisted of men from the US Colored Troops (USCT). In NE Florida for sure there was an awareness of the Emancipation Proclamation, and slaves seesawed from slavery to freedom and back more than once as the Union and Confederacy took turns at controlling Jacksonville. Emancipated slaves wait in front of the Provost Marshal’s office in Jacksonville about 1864. The 2nd U.S.C.T. was attached to the District of Key West, Florida, Department of of the Gulf, in February, 1864, and saw duty in New Orleans and Ships Island, Mississippi. In May the unit also participated in an attack on Confederate fortifications at Tampa, resulting in the destruction of the Confederate positions. The 2nd participated in several operation along Florida’s west coast between July 1st and 31st, 1864; including raids from Fort Myers to Bayport, and from Cedar Key to St. Andrew’s Bay. During the St. Andrew’s Bay expedition the 2nd skirmished with Confederate troops on the 18th of July. My guess is that many slaves in west-central Florida – and admittedly, the huge part of the slave population resided in the northern part of the state – would have been aware of the Proclamation from Union soldiers. 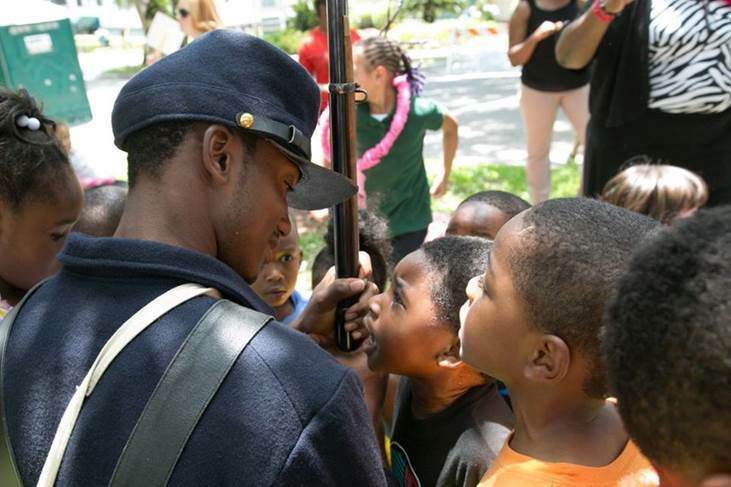 From the 2015 Emancipation Day Celebration in Tallahassee: a member of the 2nd Infantry Regiment U.S. Colored Troops Reenactment Unit speaks to a group of school children. 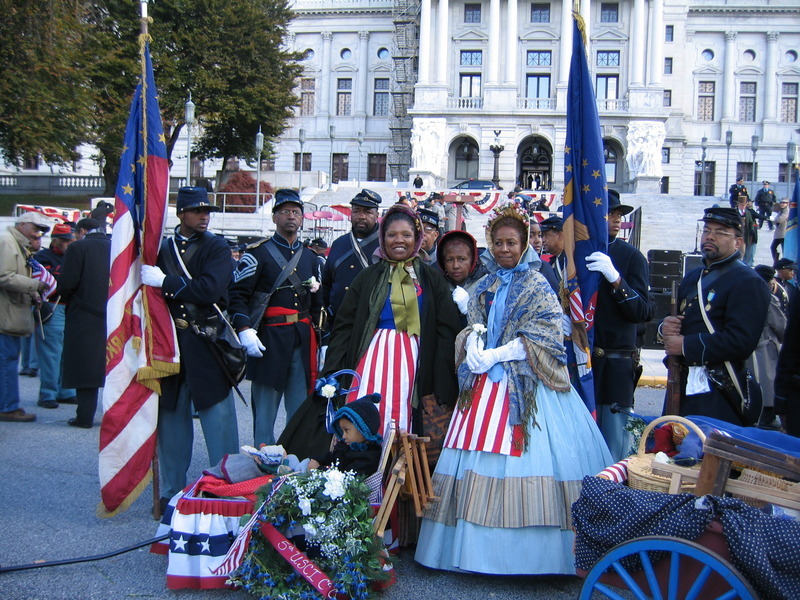 US Colored Troops reenactors/living historians at the 2010 Pennsylvania Grand Review commemoration in Harrisburg Pennsylvania. Image Source: All photos courtesy Yulanda Burgess. As noted in Wikipedia, “The Grand Review of the Armies was a military procession and celebration in Washington, DC, on May 23 and May 24, 1865, following the close of the American Civil War. Elements of the Union Army paraded through the streets of the capital to receive accolades from the crowds and reviewing politicians, officials, and prominent citizens, including the President Andrew Johnson.” The Grand Review was basically a victory parade for the Union as it celebrated its defeat of the Confederate States of America. Some 180,000 African Americans enlisted in the Union army, and were part of the US Colored Troops (USCT) – the part of the army that was created for the organization of black soldiers into the Union army. Yet, none of the regiments from the USCT were represented in the Grand Review. Some say this was a slight of black soldiers; others have noted that the USCT was engaged in other activities that made them unavailable for the Grand Review (a number of troops were sent to Texas over concerns for the protection of the Mexican border). For whatever reason, the black soldiers were not there for this glorious celebration of victory. 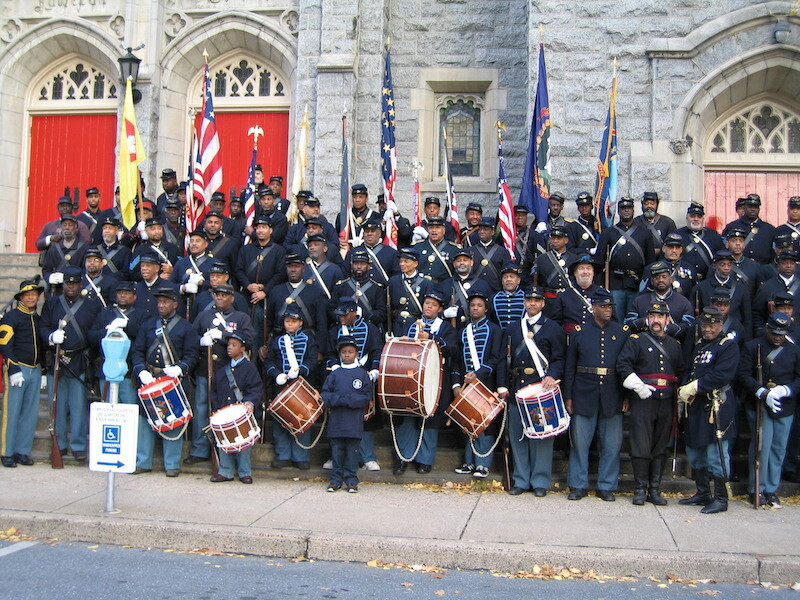 Black veterans held a parade in Harrisburg on November 14, 1865. Thomas Morris Chester, Harrisburg’s most distinguished African American, served as grand marshal. The parade formed at State and Filbert Streets (now Soldier’s Grove). The soldiers marched through Harrisburg to the South Front Street residence of U.S. Senator and former secretary of war Simon Cameron. Cameron reviewed the troops from his front porch and thanked them for their service to the nation. Other speakers included Octavius V. Catto, an African American educator and USCT recruiter from Philadelphia; William Howard Day, abolitionist and clergyman; and Brevet Major General Joseph B. Kiddoo, former commander of the 22nd Regiment USCT. 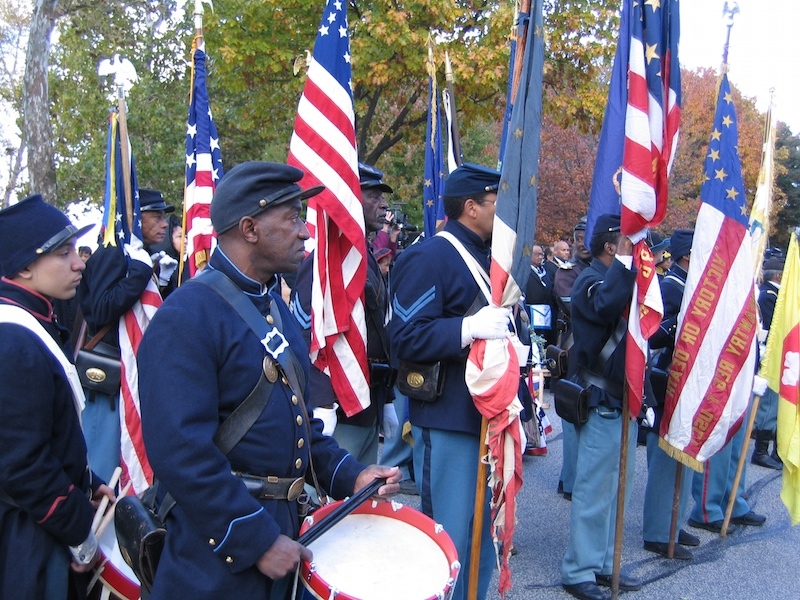 Pennsylvania was the only state to thus honor black soldiers who had helped save the Union. Harrisburg is the capital of Pennsylvania, and a more central location for the state’s African American population. At the start of the war, Pennsylvania had the largest black population of any northern state, with 56,949 black residents. 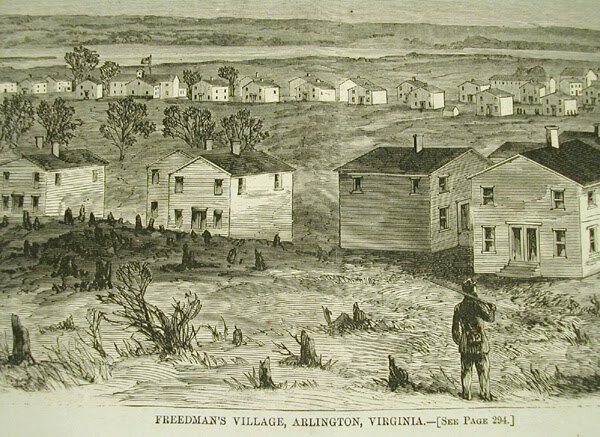 Pennsylvania also provided the most black soldiers of any northern state to the Union army, some 8,600 men in all. In November 2010, a reenactment of the Pennsylvania Grand Review was held in Harrisburg. 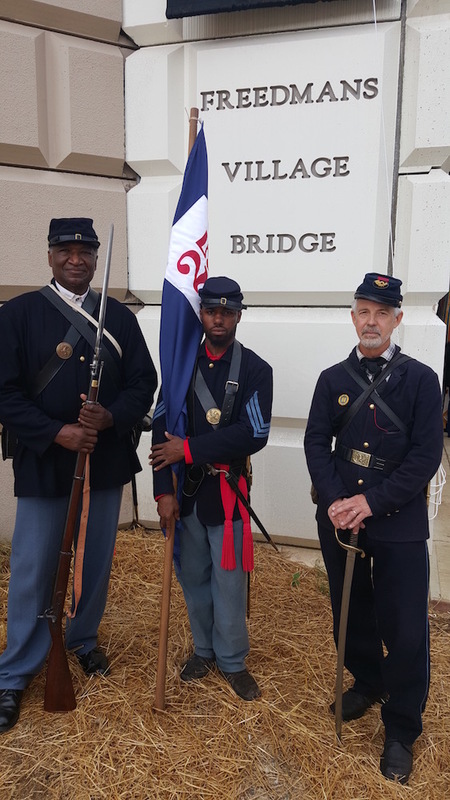 Various USCT reenactors from around the country participated. In addition to the reenactment of the Review Parade, there were numerous educational and cultural activities in the days before the march. It was a grand event. Yulanda Burgess, who is a living historian, took a number of photographs from the event which are shown above and below. 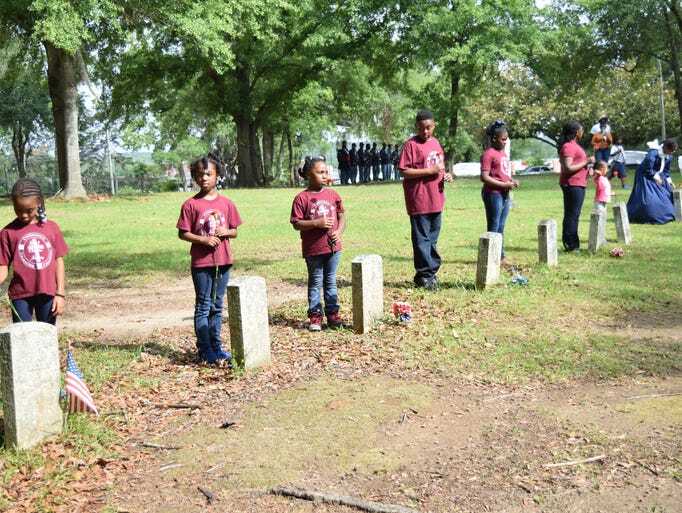 These belie the notion that African Americans are not interested in the Civil War. Picture taken in Washington, DC, in April 2015, near Ford’s Theater. 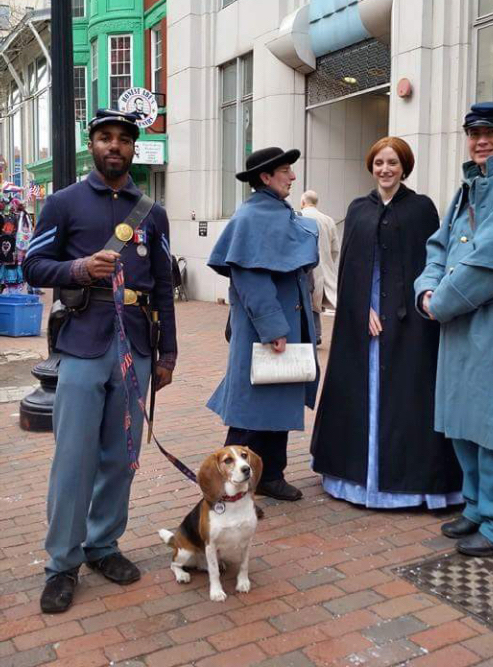 At left is Marquett Milton, a Civil War/US Colored Troops reenactor, with one of man’s best friends, along with other folks in Civil War era dress. The past few months have seen a number of Civil War events in Washington, DC, such as the commemoration of Abraham Lincoln’s Second Inauguration, Lincoln’s assassination, and the abolition of slavery in the District of Columbia. Perhaps the biggest event will be the Grand Review Parade, scheduled for May 17, 2015. Be there, so you can take a picture of a Civil War reenactor with a dog… or something like that.